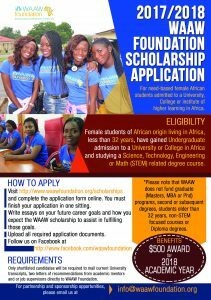 WAAW Foundation is p leased to announce its 2018 need-based scholarship, offering $500/year for female African students presently admitted to a University, College or institute of higher learning in Africa. Scholarship recipients receive an award of $500 for the 2018 academic year, or the equivalent in their country’s local currency. Female students of African origin living in Africa, less than 32 years, have gained Undergraduate admission to a University or College in Africa and studying a Science, Technology, Engineering or Math (STEM) related degree course. Candidates must demonstrate financial need and excellent academic record. Prior scholarship recipients may reapply for renewal, with proof of continued excellent academic performance. Special consideration is given to underprivileged students such as orphans, girls affected by HIV or students in first/second year of study. *Please note that WAAW does not fund graduate (masters, MBA or PhD) programs, second or subsequent degrees, students older than 32 years, non-STEM focused courses or Diploma degrees. The Application Process: WAAW Foundation will accept online applications from September 1 through November 30, 2017. Applications submitted prior to this date will not be received or reviewed. Scholarship applications are reviewed by the WAAW Foundation Scholarship Committee, and awards are announced by February 2018. 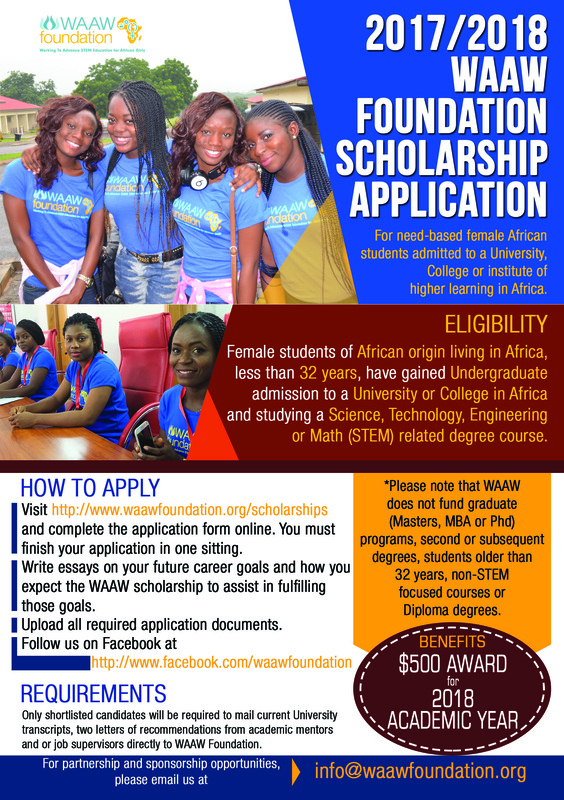 How to Apply: Visit the WAAW foundation web site at http://www.waawfoundation.org/scholarships and complete the application form online. Follow the application instructions carefully. You will be required to write essays on your future career goals and how the WAAW Foundation scholarship will assist in fulfilling your career goals. We also require two letters of recommendation, from academic mentors and/or job supervisors. You must finish your application in one sitting. Only shortlisted candidates will be required to mail current University transcripts directly to WAAW Foundation by November 30, 2018. We will not be accepting paper applications this year, hence application documents must be submitted electronically via our online forms. Examples of courses that are not eligible to apply: Nursing, ICT, diploma, Mass Communication, Social Sciences, Accounting, Business Administration, Economics, Agricultural Economics, Education etc. All applicants are strongly encouraged to follow us on Facebook at: http://www.facebook.com/waawfoundation. WAAW (Working to Advance STEM education for African Women) Foundation is a US based non-profit organization whose mission is to increase the pipeline of African girls in Science, Technology, Engineering and Math (STEM) and Computer Science (CS) related fields, and work to ensure that this female talent is engaged in technology innovation for Africa’s development. In January 2007, while working to obtain her Ph.D. in electrical and computer Engineering at the Texas A & M University, Dr. Unoma Ndili Okorafor, moved by passion, a personal awareness of the huge technological and digital divide between Africa and many developed nations, and the recognition that female education as well as technology innovation play a crucial role in economic development and poverty alleviation of any nation, founded WAAW foundation. WAAW is a non-profit tax exempt 501(c) organization (EIN 20-8576703) incorporated in the state of Texas, U.S.A., on the 5th of January 2007, and registered with the Corporate Affairs Commission of Nigeria. To train and engage women leaders who contribute to technology and economic growth in Africa. To become the premier international partner of choice within a global movement dedicated to ending poverty in Africa through female education. (a) Engage African girls in the process of promoting STEM education at all stages. (b) Build a sustainable and connected community that empowers girls in STEM to help themselves and each other via peer-to-peer mentoring. (c) Build a repository of localized STEM resources that employ locally available, low cost resources to promote STEM education and innovation. (d) Build an ever-increasing pipeline of women leaders in STEM through a feed forward process. (e) Focus on sub Saharan Africa to build critical mass. (f) Engage international partners and bring significant value to our partners and funders.